The comments from the vetters were both very helpful and extremely thorough containing not just sound route advice but some great tips on places to visit. 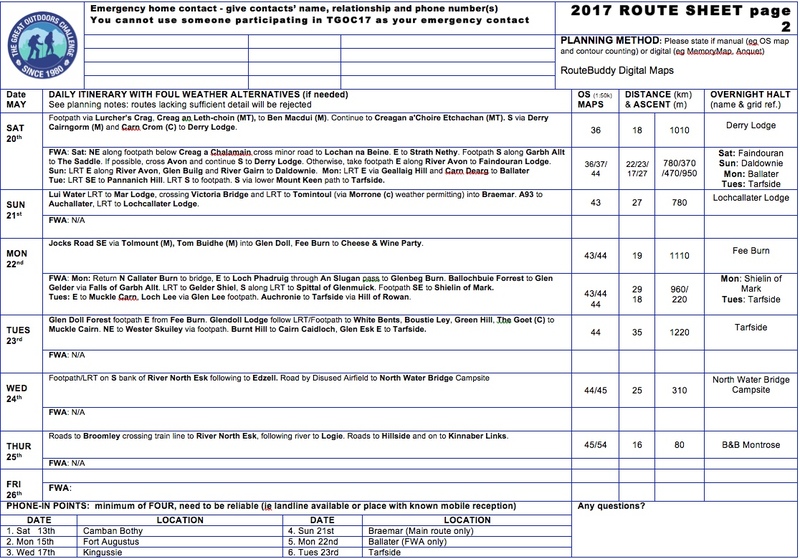 Equally they provided a suggestion on what to avoid, namely the new wind farm currently being constructed at Stronelairg on the Monadhliath (mainly due to the heavy construction traffic/machinery in the area). 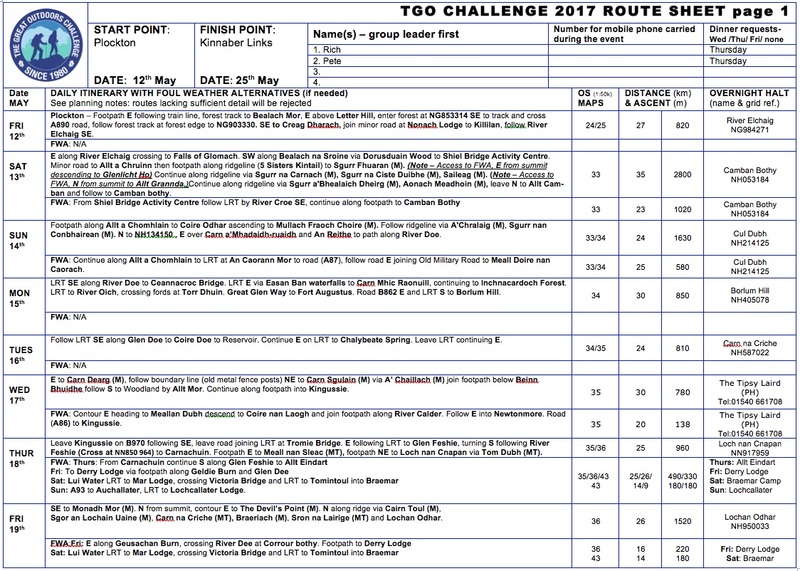 The minor adjustments the vetters requested were to add a few additional way points/grid references to assist challenge control in following our route. Also the addition of one extra phone in point. Rather than change the planned route we’ve reviewed the “escape routes” which we feel offer safe (with some care) access off the ridge down to the FWA. The FWA for this day will be a nice route so if weather or indeed our enthusiasm mandates it then we’ll be happy to make use of the FWA. Looks like a challenging route you have planned out there. Your second day is an absolute monster! 35km and 2800m of ascent. On my last TGO in 2015 my first day went over the Moidart Corbetts, 2800m of ascent but manageable at 23 km. I was absolutely wiped out by the end of the day. Best of luck for a spell of good weather at the start to get you on your way. Hi John, yes it certainly is, I keep telling myself it’s meant to be a challenge…although day 2 might be a step too far. Totally dependant on weather and our enthusiasm at the time, but hopefully it all comes together. I recently discovered your website, some great info and brilliant photos. Your route looks just as demanding, if not more! Similar total distance but ~2500m more ascent! It looks like our paths won’t cross and unfortunately we’re heading home on the Friday so we won’t see you at the finish line. Have a good crossing, fingers crossed for some reasonable, summit compatible weather!